Athens, GA (Feb 6, 2008) - Sometimes when you look a network broadcast highlights for the coming month when one event kind of jumps out of the page and grabs your attention. This is the case for the March 1, 2008 ESPNU broadcast of the United States Military Academy's 51st Brigade Boxing Open. This tournament is open to any and all Academy cadets that want to enter the ring and earn glory among the Corps of Cadets. 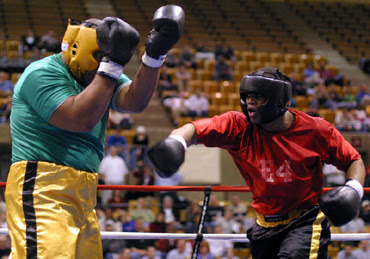 In this 2003 bout, Senior Craig Cunningham (left) defends against the blows of classmate Rob Horton during the heavyweight bout. Horton won his second heavyweight title with a unanimous decision over the former Army football player. Last year, the Times Herald-Record reported that Friday Night Fight's Analyst Teddy Atlas analyst did the broadcast for free. ESPN officials told analyst Teddy Atlas (pictured left with Joe Tessitore) they would love for him to call the Brigade Boxing Open. There was one catch: Network brass told the famous trainer that they couldn't pay him as much as they do for "Friday Night Fights." Atlas, who will call the fights with partner Joe Tessitore on ESPNU tonight, is working for free. "My response to ESPN was pretty simple: For me, doing this is a privilege," Atlas says. "These kids at West Point are making some kind of commitment. They are going to protect me and my kids. It's a risk not a lot of people would take and it was easy for me to say yes." The event will be broadcast at 8:00 PM on Saturday, March 1, 2008. Friday Night Fight's Teddy Atlas and Joe Tessitore will call the action. Bout photograph courtesy of the United States Military Academy. 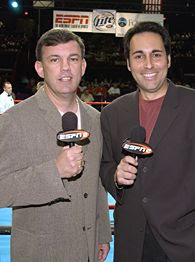 Photo of Teddy Atlas and Joe Tessitore courtesy of Rich Arden/ESPN.